Maybe I’m reading too much into it, but the implication certainly seems to be that corporate finance is less worthwhile than other fields of endeavour. This seems to be over-stretching the point in at least two ways. 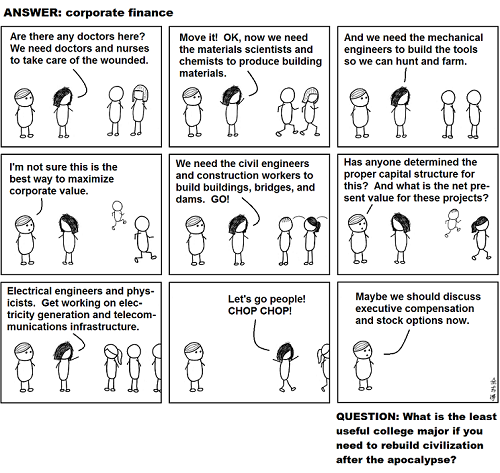 Most directly, there’s the problem that vast swathes of academic study would in fact be just as useless as corporate finance immediately after the apocalypse, when we need to recreate known technologies rather than innovate new ones. We might need medics, but not research biochemists. Engineering perhaps, but not physics. The entire of mathematics beyond calculus would be superfluous for the most part. And that’s not even touching on the humanities. The other way I find this unsatisfying is that I think planning for an apocalypse is insufficient as a means of deciding what’s important right now. Hypothetical scenarios provide stark clarity at the expense of nuance and detail, and considering only one hypothetical necessarily biases the outcome: politicians and historians are pretty useless if society has just been reduced to rubble, but might be very useful at preventing the rise of a malign dictatorship. Deciding exactly what we should be investing more human effort in is an important issue with no obvious answer, and this sort of sneering isn’t moving the debate forwards. This entry was posted in Business on November 16, 2012 by admin.